Luckily, there are still places you are only allowed to reach by walking and Rifugio Nambino is one of them. 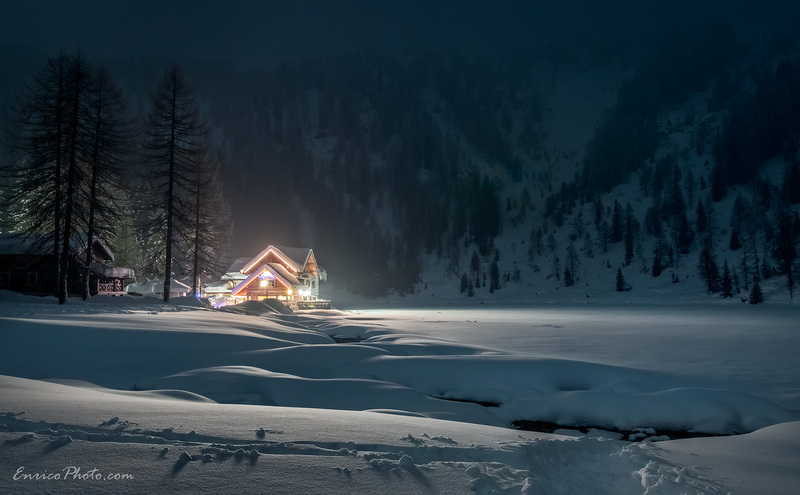 Located in the Adamello-Brenta National Park (Trentino, Italy), the mountain refuge sits right by Lake Nambino, which is frozen and covered in snow in winter. The easiest way to reach Rifugio Nambino is from Madonna di Campiglio. You first drive to where the refuge's cableway is located (which is also where the road ends) and then hike up from there. We found the cableway very handy as we could load our luggage on it, rather than carrying it all the way up. People cannot use the cableway, it is just for stuff! The hike is supposed to be about 25-minute long, but it actually took us 45 min to reach Rifugio Nambino, as I was carrying a crate with our cat Alya in it (8kg overall) and we were also happy to stop from time to time to enjoy the snow and let our Newfoundland dog Coda discover new smells in the woods. By the way, a big thank you to the owners and the staff of Rifugio Nambino for being pet friendly! 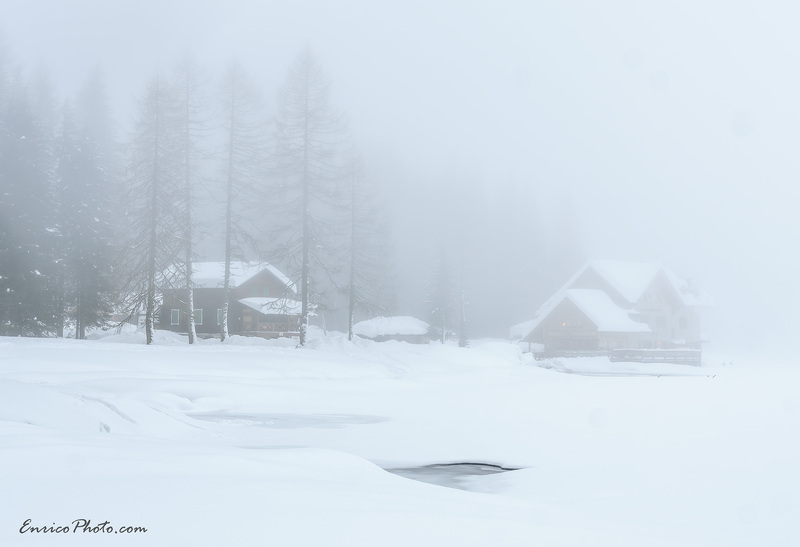 After relaxing a little bit in our room, I started to wonder around the frozen lake to scout for compositions. Looking at the photo below, you can imagine it only took me about 10 seconds to realise that, if they persisted, the low clouds would prevent me to get the shot I wanted. While it is true that I had a single night to get my image, I was sensible enough to book a room up there, so that at least I had the ENTIRE night to fulfill my goal. Remember the landscape photographer's motto: Never Give Up Until it's Over! Indeed, I did not lose hope at all when, at first, the low clouds seemed to be willing to hang around the refuge forever. In the end, I did not have to wait too long. Around 9h50pm the clouds cleared up, leaving just a translucent curtain of snow, that was invisible in the foreground and middle ground (due to the small aperture I used) and just created a little mist in the background, which I believe even adds something to my image. Did the mist still make me pay a toll? Yes, it did! From the other side of Lake Nambino, looking at the back of the refuge, on a clear night you can enjoy a beautiful view of the Dolomites. Due to the weather, that view was entirely precluded to me. Am I disappointed about it? Not at all! The night shot of Rifugio Nambino I got is more than I could have hoped for. As I write this, I am even considering to add it to my Portfolio and, more importantly, I had a great time there with my wife Dania, Coda and Alya. As a final note, I would have actually felt more stressed if I had known the entire night was NOT there for me to capture a night shot of Rifugio Nambino. Starting from 11pm it started to snow pretty heavily and later on they even turned off the lights!